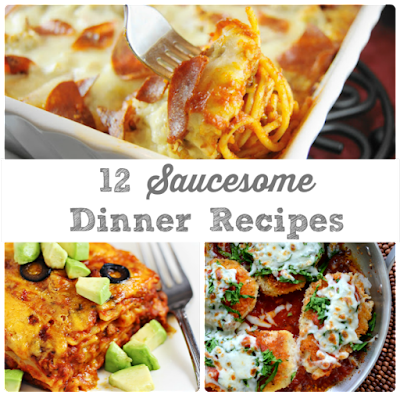 This recipe was created in partnership with Barilla, Walmart, & No Kid Hungry. All opinions & thoughts expressed below are 100% my own. While I am definitely looking forward to reclaiming my 6 hours of kid-free time on the weekdays, I am also a little sad that summer break is almost over. We had all these grand plans for this summer, but a few things (like that promised weekend camping trip in a tent) didn't get crossed off the family checklist this time around. That seems to happen just about every summer, right? But now I am getting ready to switch gears from a summer break bucket list to all of those checklists that come with the beginning of a new school year. 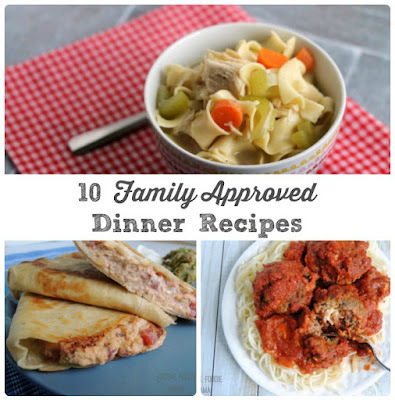 The school supply list, checking off all that required paperwork that has been signed in and turned in for kindergarten registration, shopping for the necessary back to school clothes, dorm room essentials, and last but certainly not least- weeknight meal planning. I rarely have the time to make pasta sauce from scratch on busy weeknights, so I grabbed a jar of Barilla Tomato & Basil Sauce and a box of Barilla Penne from my local Walmart Supercenter to make this recipe. 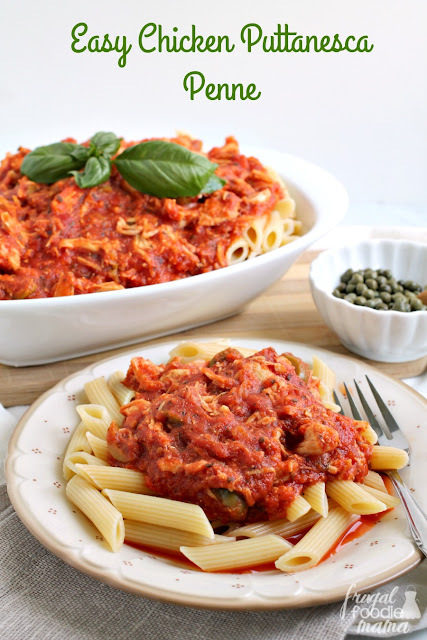 Barilla Tomato & Basil sauce contains no preservatives & is made with non-GMO ingredients. 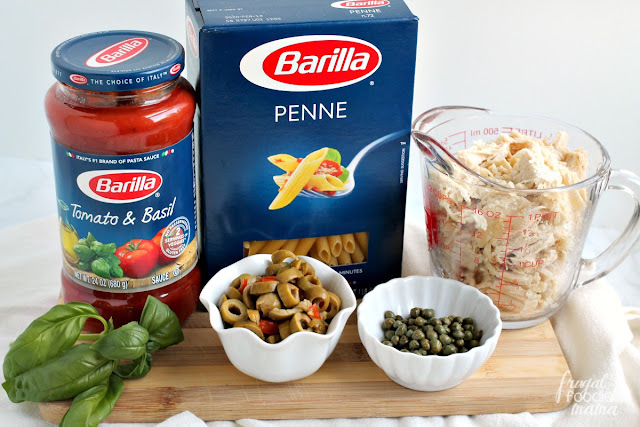 Barilla Penne is made with simple ingredients and is perfectly shaped to hold onto all of the flavor in this chunkier puttanesca sauce. 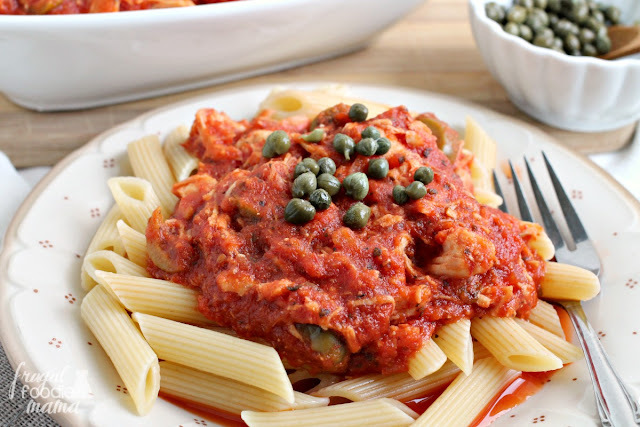 I simply cooked the penne & doctored up the Tomato & Basil sauce with the olives & chicken and voila! Dinner was ready & on the table in just 30 minutes. Did you know that nearly 1 in 6 children in this country live in a household that struggles to get food on the table each day? But you can help just by doing something that you probably already do anyways! :) While you are feeding your family by purchasing your favorite Barilla pasta at your local Walmart, you can feel good knowing that you are also helping other families get dinner table on the table this school year. 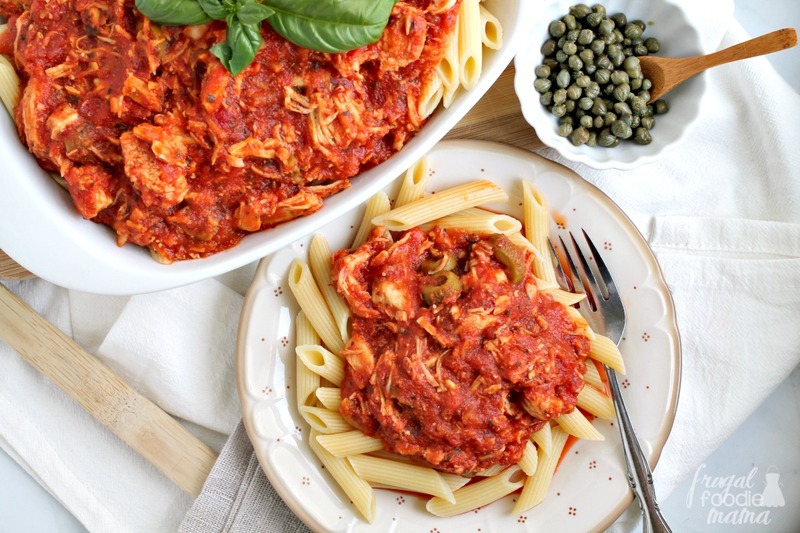 To save even more time making this recipe, use leftover roasted or grilled chicken in this sauce or simply pick up a rotisserie chicken from your local Walmart Supercenter or Neighborhood Market. Bring 4 quarts of water to a boil in a large saucepan. Add salt to taste. Add the penne to the boiling water. Boil the penne about 10-11 minutes until al dente. Once cooked, drain the penne into a colander. 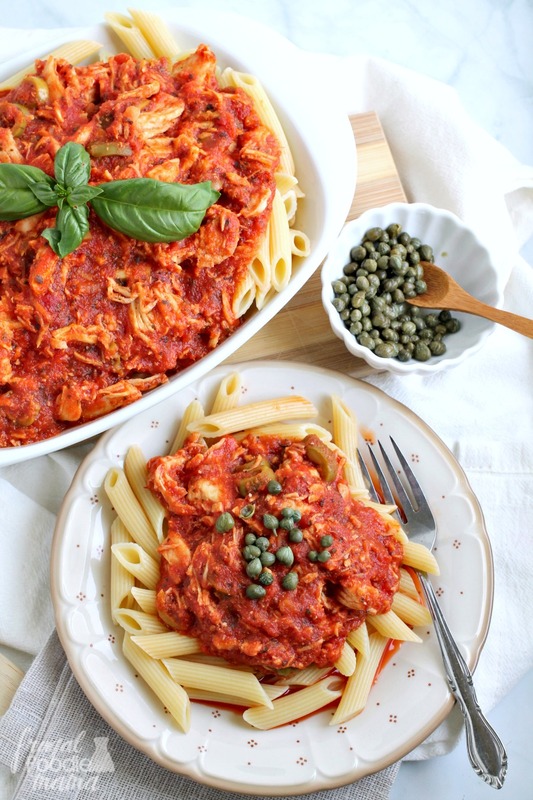 While the water for the penne is coming to a boil, prepare the easy chicken puttanesca sauce. Add the Tomato & Basil sauce, the sliced olives, & the cooked chicken to a large saucepan. Heat over medium-high heat until heated thoroughly. Plate about 1/2 cup of penne per serving. Ladle about 1/2 cup of the puttanesca sauce over the penne. Garnish with capers, if desired. Serve immediately. Do you meal plan during the school year? 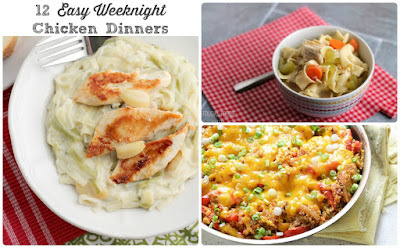 What is one of your favorite go-to dinner recipes for busy weeknights?